Have you ever noticed that many large animal exhibitors, zoos and small aviaries keep common poultry on the premises? Have you ever wondered why? In the 30-plus years that we have kept parrots, there have always been chickens, Guinea fowl and turkeys at our place. For a 2.5 acre farm, we kept about 30 birds. On our new farm, which is 17 acres, we are able to keep a lot more of these barnyard birds. They fulfill many functions. oultry also eat tender young plants. As the weeds and grasses grow, they get eaten. If you have some favorite plants you don't want eaten, fence them off. I just use some field-fence that they cannot get through. It is inexpensive and easy to work with. I have used the chickens to clean up areas of our new yard that were overgrown with weeds by fencing them in an area until it is eaten clean! These birds can also be eaten by humans, and by parrots. We don't feed our poultry the commercial, antibiotic-added foodstuffs, so they are an excellent source of organic food, as well as organic fertilizers. When purchasing commercial foods, for small chicks in particular, I buy non-antibiotic feeds. As the chickens mature, I switch them over to safflower seed and, of course, all the leftovers in the kitchen. Not a scrap goes down the disposal when you have poultry. When poultry is raised in small flocks, you get homegrown eggs that you (or your birds, if there are enough) can enjoy. Our parrots love homegrown boiled chicken and rice, and fresh scrambled eggs, too! One other function of poultry running loose, especially the Guinea fowl, is that they act as alarms. If something moves, even at night, they tend to panic. You can hear them before an intruder or predator can get access to your aviaries. Peacocks are especially loud and territorial, so check and make sure they would be welcome in your neighborhood. Guineas, once they are adults, are impossible to catch. They range a lot farther than the peafowl, and come home to roost. Take advantage of the natural territorial instinct of these birds, and work with it. It can be likened to teaching a fish to swim. Guineas like to eat ticks, too. They are a favorite food, and Guineas can be observed looking at every blade of tall grass for these little insects. Biological control is where you find it! One really interesting aspect of poultry on a parrot farm is that when children visit, they want to catch and hold a chicken. You can have the most beautiful, rare parrot on the planet, but the children only want to hold the chicken. It never fails. I think you could open an entire zoo with nothing but chickens, and the little kids would come every day. Okay, now to the nitty gritty. First, make sure you are zoned for a few pet chickens. 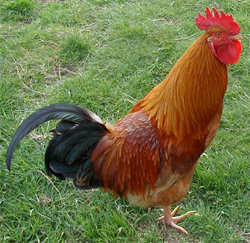 Many communities don't want the males, or roosters, but hens are accepted. Hens don't make a lot of noise. They cluck when they lay eggs, and that's about it; no crowing. When we purchase poultry, it's usually via mail, unless we buy from the local feed store or a local farmer. I purchase from Murray McMurray Hatcheries. It has been in business since 1917. You place an order, confirm the shipping date, and tell your postmaster to call you when the order arrives. When I do this, there is often a line at the post office to see who got chickens in the mail. It is a safe way for them to be shipped, because baby chicks are living on their yolk sac for 48 to 72 hours after hatching, and require no food. The Murray McMurray Hatcheries Web site is linked on our site. Its catalog is reminiscent of our grandparents reading the old Sears Roebuck catalogs — fun, educational and beautifully illustrated. The birds you purchase should be vaccinated. The first, most important one, is for Marek's disease. This currently costs 11 cents per bird and is done by the seller prior to shipment. We always order our poultry with this vaccination done. In addition to vaccines, our favorite supplier sells a variety of equipment, supplies, vitamins, brooders, antibiotics, insecticides, and books — and the baby birds come with directions! If you follow them to the letter, you will be successful. Follow-up vaccinations are also available for your poultry including Newcastle, bronchitis, pox, laryngotracheitis, coryze and bumboro vaccines. These vaccinations are not for your parrots. Vaccines for parrots are different. If you have no equipment at all, they sell a "starter kit". This consists of a specialized water container, specialized food container, an electrolyte called "Quick Chic," a heat lamp source and a cardboard circle. Baby chicks can be suffocated by bunching up in the corners if they are kept in square areas, so circular areas are used to contain them. We have a professional brooder, with thermostatic controls, and a small place set aside for the baby chicks that is not in any draft. As the chicks grow, I have a small "barn-ette" for them. It is built to allow the chicks to spend the night by a heat lamp, and the day in the sunlight behind a small wired-in area. They are now being trained to sleep in that particular area, and it can be closed off at night against predators. Predators range from ravens, hawks and owls to pussycats, skunks, raccoons and even your own pet dog. Make this area well built and strong! I use wire under the area, too, against things that dig to get in. We have successfully trained our dogs to ignore the chickens, just as they ignore the parrots. It took a while, but even the chows and rottweilers eventually understood that the birds were not toys. Our choice of chickens are the banty-hens. They are particularly intelligent and can also be used as emergency incubators for our parrot eggs. They can be kept in the house if you absolutely need to use them for this purpose. I feel that they have the strongest urge to sit on eggs of all the chickens, except perhaps the jungle fowl, and will even sit on rocks painted white if you need to get one "in the mood" before using her for a parrot egg. We also keep a flock of free-range roosters — just some mixed heavy-breed birds, to keep the meadow and our woods cleaned up. They mostly feed themselves, and are not required to come back to the barn area at night. They are fed grain each day, just to make sure they get enough to eat, and then they forage for themselves. Starting at Day 1, we tell our chicks, "Here, kitty kitty kitty." We say this any time we are doing anything around them at all. I have a small treat in my pocket, which is given in association with the "call," so that they will associate that particular call with getting fed or a great treat. It is an extension of how we speak to the baby parrots at feeding time. It is absolutely hilarious to go out to the meadow and call, "Here kitty kitty," and have several turkeys and lots of chickens come on the run. You can use any call you like, or even a whistle — just make sure everyone who works with the birds uses the same call. You can get them in at night that way too, or walk them around behind you while calling them, or even take them on walks if you want to amaze your neighbor kids. I take my poultry on walks down the rows of aviaries when I feed the parrots. Kids have come here especially to see the trained chickens. Remember the chicken at the state fair that played the piano? Every state fair used to have one. Put in some money, food comes down, the chicken pecks the piano keys to get it. It is a trained response that they can learn. That makes them look very smart, and the bird owners probably made a small fortune. If your fowl tend to fly up to the tops of your aviaries to roost, you can give them a wing trim, just as you would your parrots. This will keep them grounded. Chickens are fun to watch, easy to raise, easy to keep, and beneficial. Have fun with your new bird friends! Geoffrey and Barbara Gould are conservation breeders of large macaws. They also do worldwide hookbill rescues via the Internet at www.primenet.com/~macaws. Between them, they have 70 years of bird experience. Their farm is in Point Arena, Northern California, overlooking the Point Arena Lighthouse.